Part of the exhibition Kopenhagen in Hamburg at Gängerviertel. For the Kopenhagen in Hamburg exhibition we have selected works by a few of the Danish artists we have shown, works which all, in telling their story, also shed light on the process of telling a story. In English the phrase ‘telling stories’ can be understood literally, but is also a children’s phrase for telling little white lies. This simple phrase therefore communicates something essential about the art of narrative, which is that it always involves an ordering and rationalisation of events which, as they happened, were in all likelihood more haphazard — the art of telling a story, then, in a sense always involves a degree of ‘invention’ with respect to lived events. Katrine Dirckinck-Holmfeld’s Djisr – The Bridge is set in a half-finished international art and culture fair outside Tripoli (Lebanon), which was designed by the architect Oscar Neimeyer, and abandoned mid-construction on the outbreak of the civil war in 1975. 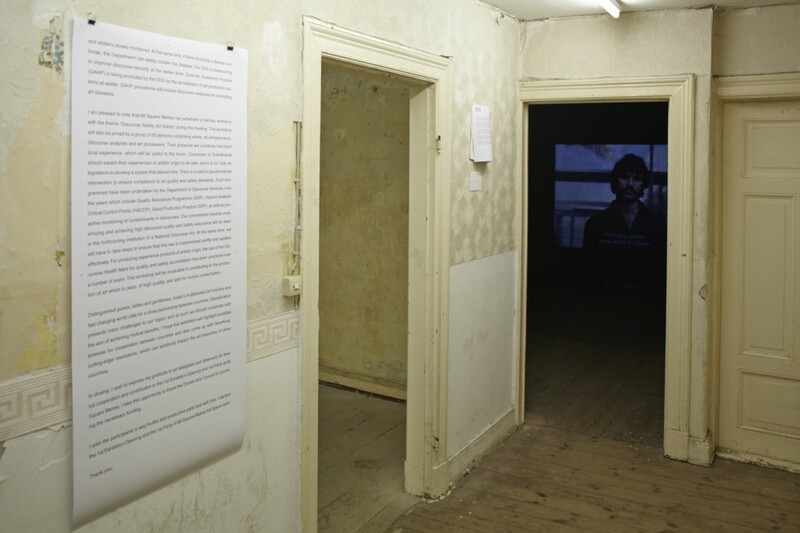 It works consciously with the film medium and the artificiality of the set-like surroundings of the unfinished architecture to communicate the disorientation caused by, and the apparent impenetrability of, the issues surrounding the civil war and the following social conflicts in Lebanon. Jacob Sikker Remin’s video piece springs from his land art project Tetriads No. 2, which was built on the island of Sejerø in Denmark this summer. We hear two of the island’s inhabitants relate their personal experiences of UFO sightings there, while Remin’s land art piece, filmed at night, takes on a different character, both through the video medium itself and in interplay with the stories, which naturally also become coloured by the images. The text Opening Speech was written for the opening of 68m2’s first exhibition in May 2011, where it was performed by an actor playing the role of an official representative. The speech takes, in a humorous way, a critical look at some of the systems of the international art scene and the ways in which governments may wish to make use of culture.